The Twilight Series III Finale saw a total of 11 Keelboats, 5 Cruising Multihulls and 4 Beach Catamarans taking part. Going into the finale, participants were quietly hopeful for a good blow to finish the series on a high. Thankfully, a north-easterly breeze set in at the start, carrying the sailors on an exciting first leg up to changi buoy. It was however a tactical challenge for participants as they had to contend in varying wind conditions over the course of the race, from an initial north-easterly winds to shifts all the way to a north-westerly direction. This coupled with patchy winds scattered throughout the course kept skippers and tacticians on their toes. In the Beach Catamaran Class, Nigel Signal’s Stray Catz led the fleet to secure his first bullet for the series, leading Persian Cat and the 2 Wetas to take victory for the final race. Their victory consolidated their position for the Series, finishing 6 points ahead of Persian Cat and 11 points ahead of Madfish II in 3rd. Great to see the Wetas starting to take part in our Club Series! Despite losing the series, Persian Cat did enough to take the overall Twilight 2018 title, winning Madfish II on tie-break. Stray Catz completed the podium in 3rd. The Cruising Multihulls went into the final race with Cicak and Eeepai tied on points, the 6th race being the deciding race. The latter displayed a dominant performance to finish the race with line honours and a bullet to seal their victory in the Series 1 point ahead of Cicak. Witblits did well to finish 3rd in the 6th and final race for the series, but poor attendance resulted in an overall 6th place finish in the Series. Despite their false start and eventual 4th in the final race, Miss Visayan’s consistent performance rewarded them with 3rd in the Series, a good result for their first Twilight campaign! For the overall 2018 Twilight leaderboard, Eeepai’s win reflects their final standings, beating 4-time defending champions Cicak to claim their first challenge trophy. Witblits’s 6th place finish in Series III was good enough for a 3rd overall in the Twilight 2018 standings. A good start powered Temptress of Down into an early lead ahead of the 7-strong PY fleet on Saturday, taking full advantage of the fresh breeze. They however failed to consolidate their position as Sangaree clawed back from a disappointing start to claim line honours and eventual 2nd place after corrected time. Southern Light thrived in Saturday’s conditions, staying close to the leaders to earn a well-deserved bullet for the Series, relegating Temptress of Down to 3rd. 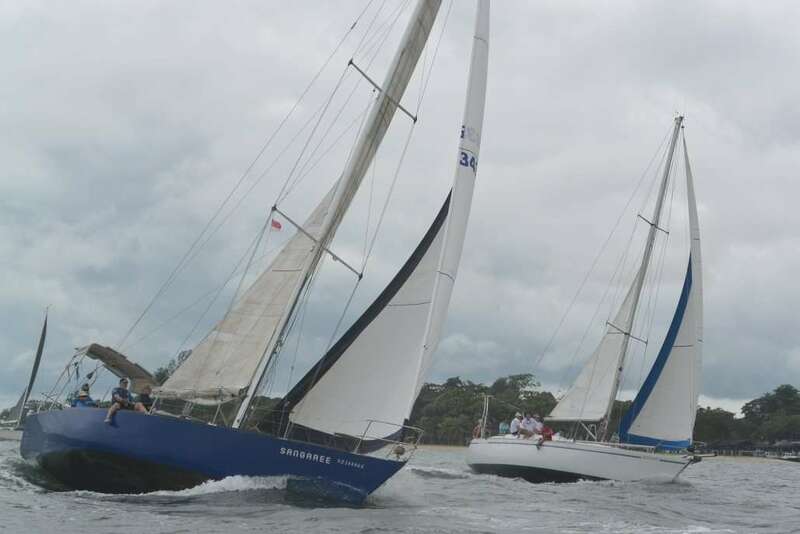 Southern Light’s bullet leapfrogged them to 2nd in the Twilight Series III standings, 1 point ahead of Minx in 3rd. Despite their disappointing performance in the final race, New Blue Eye‘s 5th place finish was good enough to fend off rivals and claim victory in Series III on 17 points. This in turn also rewarded them with the overall 2018 Twilight PY Class Challenge Trophy, staying 1 point ahead of Minx on 8 points. Southern Light‘s 2nd place finish in Series III helped to secure their 3rd place with 10 poitns in the Twilight overall leaderboard, rounding off the winners for PY. Shardana returns to Club Racing in style, displaying a good start to claim an early lead and eventual line honours in the IRC Class. The excitement however took place amongst the remaining 3 boats of the fleet, as fierce rival resulted in a thrilling shuffle of positions throughout the race. Waka Tere emerged the best of the rest, claiming 2nd across the line and on handicap. Jong Dee bounced back from a bad start to claw her way back and finish just ahead of Sky Bird. However this effort was not enough to dethrone Sky Bird, who eventually claimed 3rd on handicap. Her 3rd place finish also sealed her victory in Series III for the IRC Class, finishing 4 points ahead of Jong Dee after 6 races. Despite her absence in the remaining 3 races for the series, Invictus did enough to secure a 3rd in the Series. In the overall Twilight 2018 standings, Jong Dee took home the IRC Twilight 2018 challenge trophy, winning Invictus on tie-break. Red Rum’s 3rd place finish marks a good year for the boat, a good news coming after their successful campaign at the Raja Muda. Congratulations to all the winners and a big thank you to all the sailors who joined us throughout the year!